Published in 1992, “The Thief of Always” is a children's fable intended to be read by all ages. Written by dystonia author Clive Barker, this book was a prime example of a eloquent story with a childish twist. Classic books are dying. It’s just a fact. Most readers today prefer modernized books, with state of the art technology and current ideas integrated within them. So what will happen to the skillfully written words, strung together by pages from the past? 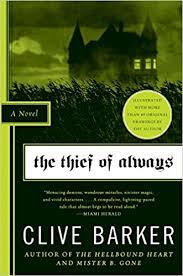 “The Thief of Always” is a thrilling tale that was, *gasp* written over 25 years ago, by best-selling dystopian novelist Clive Barker. Now, this book might not be considered a classic since it came out in 1992 and is not as well known as say, “Frankenstein.” However, a review by Publishers Weekly described this book as, “A welcome modern-day return to a classic form.” But to put it simply, older books are losing their value in today’s modern society. This book, as well as many other classics, are slowly being forgotten. Now I wasn’t always big on classic books, as are most of the population. However, when curiosity provoked me to get out of my comfort zone, I discovered this magical book. After I read it, I realized that these books, the ones people have been ignoring for decades, created the fundamentals for today’s writing standards. So pick up that old book gathering dust on your shelf. “The Thief of Always” is one of the classics that has bestowed its expertise into my life. If you like any dystopian novels like “The Hunger Games” or “The Giver,” then you will be doing yourself a favor by reading this book. Through electrifying tales of a boy named Harvey misconceived into believing in a utopia away from our world, then turned into a dystopian nightmare, this book is definitely a thrilling read. When Harvey had a case of the winter blues, an enchanting creature offered him a deal no kid could refuse; new adventures every day, with anything he wishes at the snap of his fingers. It’s only when this paradise hints to a darker side that Harvey finally sees through the shadows and starts to ask questions. With consequential impasse, the reader takes an emotional rollercoaster that wills them to question every decision made in the book, and in the end, has a lasting impression of shock and wonderment. Barker puts a darker twist to the childhood fantasy that we have come to embrace and executed it with finesse. There are also over 40 original illustrations spread throughout the book paralleled with graphically detailed passages in order to give the reader the best possible experience when flipping through the pages. Classic books sparked a literary trend because they did it first or they did it best. That is the case for this book. Whether you are a kid in middle school, an elderly woman with four cats or anything in between, this book is a captivating read for all ages.